#SheCouldBeRoyal: Priyanka Chopra Arrives At The Royal Wedding Looking Like A Lilac Fantasy! 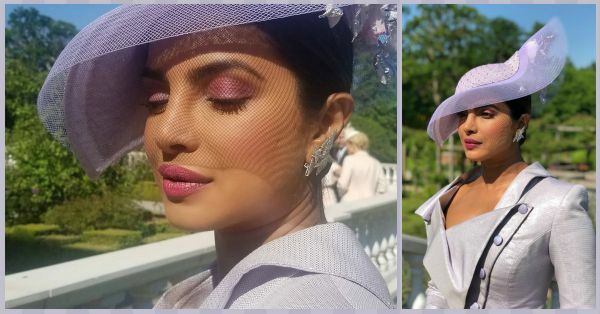 Priyanka Chopra looked like a lilac dream when she arrived for Prince Harry and Meghan Markle's wedding at Windsor earlier today. The Quantico star is wearing a custom-made lilac lunch suit by Vivienne Westwood and an elaborate fascinator designed by Philip Treacy. Chopra teased us on her Instagram stories yesterday about finally understanding what the fuss about this little hat was all about. Her fascinator, the hat, was a stunning detailed floral piece of art. The actress was dressed head to toe in 50 shades of lilac. Her makeup, done by Pati Dubroff, was nothing short of breathtaking.